I really love lamb - it has always been a favorite when dining out, but it is so expensive these days. At home, for two of us, I buy two double-cut chops and it is both delicious and reasonable when I want to make a nice dinner for Ty and myself. I find that lamb is very tender and easy to eat as a bariatric post-op. The key is to preheat that grill pan or skillet and when the chops hit the pan, leave them alone - we are going for that sear on the outside with an inside that is pink to red, medium rare. If you love lamb, give this dish a try! Arrange the lamb chops on a plate and season with crushed garlic, rosemary, salt and pepper on both sides. Allow meat to come to room temperature and marinate. 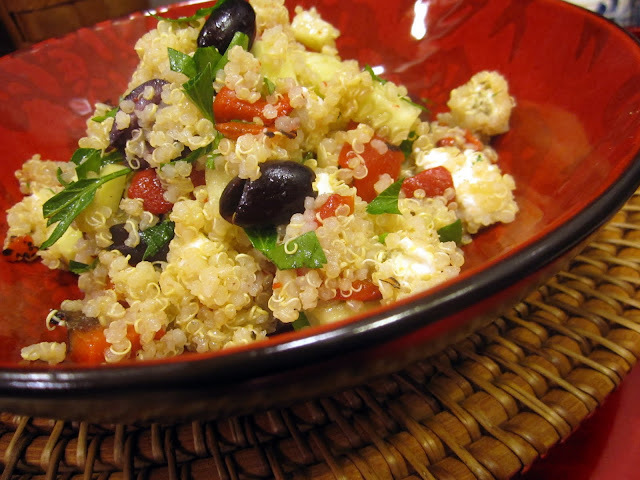 Combine cooked and cooled quinoa with roasted peppers, olives, feta, cucumber, and parsley. Add lemon and olive oil, season with salt and pepper, and toss. Heat a grill pan over high heat until almost smoking, add the chops and sear for about 2 minutes. Flip the chops over and cook for another 3 minutes for medium-rare and 3½ minutes for medium. Remove from the pan and allow meat to rest for 10 minutes before cutting into single chops. Serve with Quinoa salad.